The Rose Electronics UltraLink Lite UL-LV3 is a single local port, Digital KVM Over IP unit which sets a new standard for an economical way to remotely manage server room environments. The UL-LV3 allows you to access your computers and servers locally or across your network. The UltraLink Lite is easy to install and configure. Connect the unit, assign an IP address, install the remote viewer software, and it's ready to use. The sophisticated scaling feature allows you to position any size image of your server's video anywhere on your screen. With this feature, you can monitor servers while working on other tasks in another window. 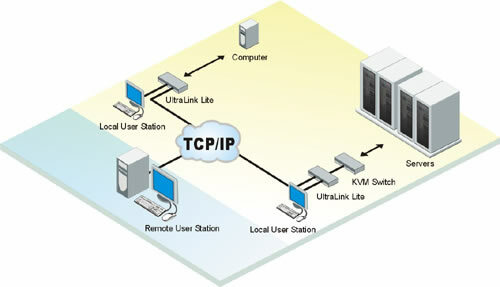 Network workstations can connect to multiple UltraLink Lites IP KVM units and display each connection in separate viewer windows. The remote client viewer program is designed to simplify accessing the remote computers. Click on the connect icon, login, and you will see a crisp, clear high quality image of the remote computer.